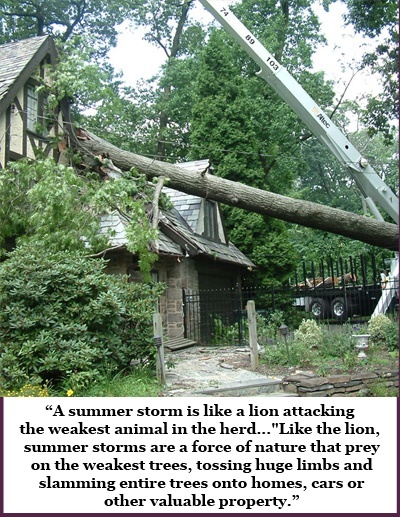 When it comes to summer storm damage, we here at Giroud have seen it all! We’ve seen tall Poplar trees that have split right in half from high wind gusts. We’ve seen entire root systems from massive Oak trees that have lifted out of the ground soaked from heavy rains. We’ve cleaned up all kinds of trees that have crashed down on top of houses, cars, fences and pools. As Philadelphia weather continues to heat up, the odds of having a major summer storm also intensify. While summer storms are inevitable, property damage doesn’t have to be! How do you know if your trees can survive a major summer storm? Check out Giroud’s Summer Checklist for Trees to know the steps you can take to make your property safe this season. Then, schedule a free evaluation with a tree company with certified arborists and great credentials. You may only be able to see obvious issues in your trees, but a Certified Arborist knows how to spot problems that you can’t! Tree Trimming: Thinning out crowns and removing crossed, weak and dead branches will ensure high winds can easily move through the tree. Tree cabling: Trees with multiple trunks or weakly attached limbs are prime targets for splitting. Tree cabling keeps limbs and trunks secure. A professional arborist will select the appropriate cable system and ensure it is installed at the right height and tension. Tree Removal: Trees that are dead or have unstable root systems are hazardous and must be removed.However, don’t try to remove a tree yourself! Tree removal is considered the most dangerous operation performed by a tree service, so you should to leave that job to the professionals. They have have the knowledge and equipment to safely remove trees, even in the most challenging locations. Deep Root Feedings, Insect and Disease Control: If your arborist sees any signs that your trees are unhealthy, he may recommend treatments to combat any issues plaguing them. Just like we take vitamins and minerals to keep us healthy and strong to fight off illnesses, your trees will benefit from regular nutrient rich fertilization! Summer storms can hit without warning, which is why all trees near your home need to be thoroughly evaluated for health and safety. The potential to save you, your family and your home from extensive tree damage is priceless! Giroud Inspections are Always FREE! Don’t Wait Until it’s Too Late! 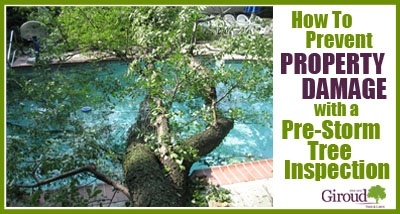 Call 215-682-7704 today to schedule your FREE Pre-Storm Tree Inspection so you can avoid emergency property damage later! How To Prevent Property Damage with a Pre-Storm Tree Inspection Overall rating:	4.8 out of 5 based on 2621 reviews.